Custom designed shelves of metal and glass matched with the raw finish of the floor result in a cool, industrial chic. Family photos intermittently arranged amongst books and files lends visual interest to an otherwise utilitarian bookcase. 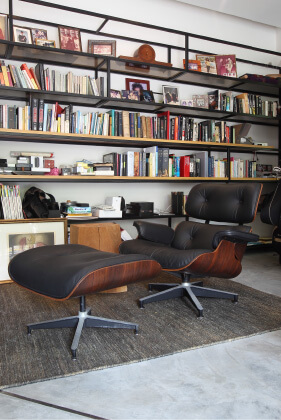 Designer pieces, such as this Eames chair and footstool, are a nice sophisticated touch. The hills of Ukay Heights in Ampang offer a quiet respite from the sprawling skyscrapers and bustling traffic in the city centre. Nestled in lush greenery and reachable via winding little streets, the homes here have much-sought-after privacy. One of them is a lawyer’s abode. Behind plain white walls and an unassuming exterior, the residence boasts a chic and minimalistic interior complete with a cosy ground-floor home office. An entire wall of the office is made up of wooden-framed glass doors, which open out to a tranquil swimming pool surrounded by grass, shrubs and a willow tree. The owner — who prefers to remain anonymous — has a relaxing ambience in which to work. The walls are decorated with souvenirs and photographs from his college days in England and a bookcase takes up another wall. Beside it stands a wine cooler and hat stand, where he hangs his lawyer’s robes and coats. The study table, which was designed by a Danish firm and imported from the US, sits facing the glass doors, overlooking the swimming pool. The initial concept was minimalist — with concrete flooring, a nice table and one leather sofa. However, as he spends a lot of his time in the study and requires his books and papers at hand for quick reference, the minimalist office soon evolved into a cosy den/library. Custom shelves were installed while furnishings were sourced from all over the world — as far as Los Angeles for the work table. Overall, the aesthetic achieved was an interesting combination of old and new. The concrete floor, which has metal strips running through it, was the brainchild of the interior designer. The strips give the floor a distinct pop, making it more visually interesting than plain concrete finish. “I don’t go into the office unless I have to. The most important thing was to have the desk by the open doors, so I would have the air-conditioning on, the fan on, but the doors would be open. It’s a very calming feeling. If you look out, you can see the willow, which I like very much, and the water helps, and the green,” he explains, adding that he enjoys being able to walk around freely when in need of inspiration. The lawyer conducts most of his work discussions via conference calls and email. His Damansara office is about an hour’s drive away. With the internet, he does not need to be in the office except for meetings with colleagues or clients. He firmly believes that working from home is the future and that he is more productive when working in the cosy and calm oasis within his abode.